Tools to help build happier and healthier families. You are in luck! Your item is in stock! 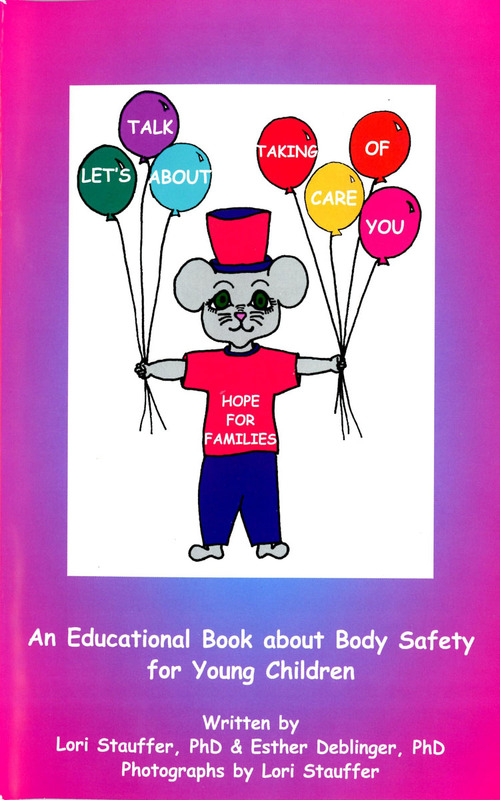 An interactive book for parents, counselors and other caring adults to read with young children to help them begin to learn about personal safety and coping skills. This book is therapeutic in nature and is appropriate and beneficial to read with all preschool and early elementary aged children, including those with and without a suspected or known history of sexual or physical abuse. Detailed guidelines are provided to help parents and other adults use the book most effectively. This book is a very useful tool in therapy with children with a known or suspected history of abuse. This book is also very useful in personal safety education lessons in the classroom. IF YOU ARE NOT COMPLETELY SATISFIED WITH PRINTED MATERIALS, WE WILL PROVIDE A REFUND OR EXCHANGE FOR UNUSED PRINTED MATERIALS IF THEY ARE RECEIVED BACK TO HOPE FOR FAMILIES, INC. WITHIN 10 DAYS OF DELIVERY. AN E-MAIL TO: [email protected] IS REQUIRED TO NOTIFY US PRIOR TO THE RETURN. RETURN SHIPPING IS AT THE BUYERS EXPENSE UNLESS THE PRODUCT IS DAMAGED. RETURN UNWANTED OR DAMAGED ITEMS TO P.O. BOX 238 HATFIELD PA 19440. REFUNDS WILL BE CREDITED UPON RECEIPT. THERE ARE NO REFUNDS OR RETURNS FOR E-BOOKS/DOWNLOADABLE PDF'S. At Hope for Families, we are committed to giving you quality service. As part of that commitment, we gather information about our customers, users of our websites and other services, and visitors so we can better serve you. Because we realize that your privacy is important to you, your privacy is also important to us. You can be assured that we respect the confidentiality of personal information that identifies you and treat that information responsibly. Hope for Families does not authorize the selling or renting of your personal information to third parties for their business purposes. We may change or add to this Privacy Statement from time to time. When that happens, we will post the revised Privacy Statement here. Your use of one of our services after changes to this Privacy Statement have been posted constitutes your knowledge and acceptance of those changes (i.e., that the changes may be applied to the information we collect from and about you). Hope for Families is not responsible for the privacy or data collection policies or practices of the services from which you access our services, of services we link to, or of any services that are linked to our services. This Privacy Statement tells you what kinds of information we collect about our customers, users, and visitors, how we use that information and with whom we may share it, and how you can access and change our information about you. If you have additional questions about Hope for Families privacy practices or would like more information, please contact us at [email protected]. We gather personal information about our customers, so we can better serve you, and we make reasonable efforts to ensure the security of your personal information and to treat that information responsibly. We collect the personal information that you give us voluntarily or in response to our request when you choose to purchase a product from us. For example, when you register with Hope for Families we will ask you to provide information such as your name, e-mail address, physical address, and telephone number. Registration with Hope for Families is generally required to make a purchase or to use one of our community functions such as posting a message on a community forum or submitting a product review. If you purchase a product, we will also ask you for financial information such as your credit card number and for a billing address and a shipping address. If you ask us to ship a purchase to somebody else, we will ask you to provide the name and address or e-mail address of the person to whom you are sending or recommending the product, as well as your name and contact information. If you are active on Facebook, Hope for Families may also reach out to you with Facebook ads that are customized to your interests based on how you have interacted with the Hope for Families website and business Facebook page. Hope for Families does not save or store or use anyone’s financial information in any way or for any other purpose than to charge the customer for their desired products and mailing information to have these products shipped or mailed to them at the address given by the customer. Hope for Families may store your contact information in order to contact you in the future about your order, product reviews or future offerings. You are in luck! Your item is in stock! Free Shipping. Copyright Hope for Families, Inc.. All Rights Reserved. by 3DCart eCommerce Hosting.